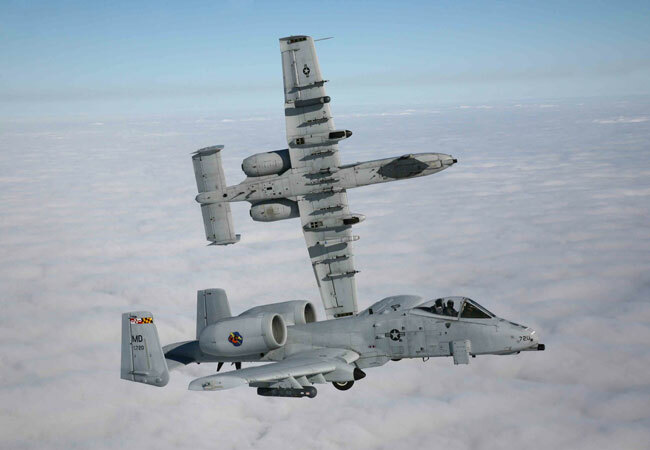 The A-10 is much maligned for its less than good looks, hence its nickname, The Warthog. Beauty is indeed in the eye of the beholder. To me, the Hog is a beautiful airplane perfectly designed for its mission. This shot shows the side of the jet and its impressive belly, showing off the 11 weapons stations. This image was one of the first I took with my new Canon 5D digital body. I shot this from the side cargo jump door of a C-130J. This is the best way to shoot since there is no glass, just me on a harness hanging out near an open door. 150 knots of air stream and no glare, heaven! Most people wonder how this image is taken, "Do you give the photo camera to the pilot?" is the usual question. In fact, I simply snap the mask on tight, lower the visor, move the wingman forward a bit turn my camera around and shoot myself! I love this type of image and doing it with the Jolly Rogers is icing on the cake. A little tip, I take a small mirror and hold it in front so I can approximate what the camera will be shooting. Depth of field is a challenge so I shoot this in manual mode with a high aperture setting and slow shudder speed. This shoot definitely gives you the sense of flight, I love shooting outside from the cockpit. Marine aviators are tough guys and are very good pilots. 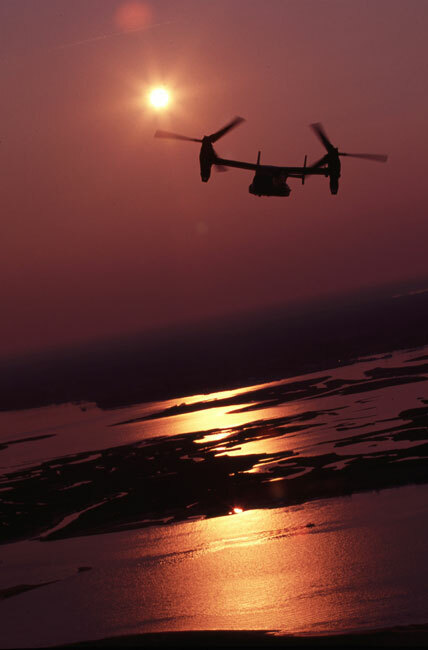 Helo's and the new MV-22 Osprey are not for the feint of heart. 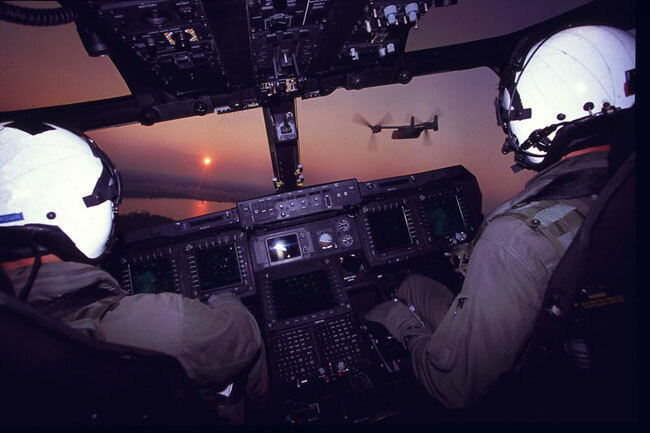 MV-22 pilots don't have ejection seats and they fly one complicated bird. Yeah the Osprey has had teething problems, but it is some fantastic plane. 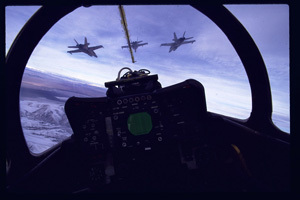 In this image I jammed myself between the pilots as we chased a squadron mate back to MCAS New River after a mission. There is just something about this photo that strikes me, I am not sure what it is. There's a vibe to this photo, maybe its the expanse of sun, sky and water, it makes the ungainly Osprey look small. I actually shot this at the end of a mission, not planning on this. Sometimes the best shots are the ones you least plan. Well this is an easy one for the Top 10 list. First off, I am a native New Yorker (pronounced New Yawka), having spent my entire life on beautiful Long Island. Any shot of a plane over the great Lady is a winner. Second, the Reserve Marine Herk operators at Stewart Air Base are one of my favorite units, great people. 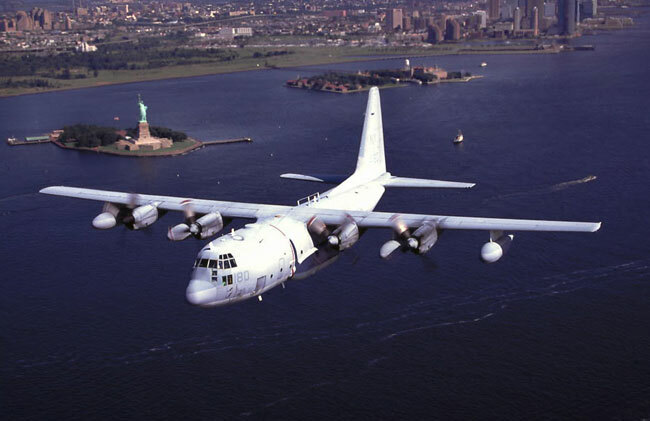 Without the C-130, much of the USAF and USMC mission does not get accomplished. No better plane to shoot out of. On this hop we came right down the Hudson River, I am hanging out the back on a gunners belt with the rear door open. You can't have more fun with your clothes on than this! 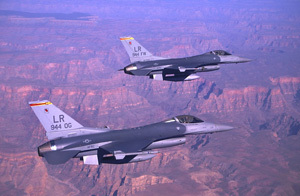 I did this F-16 ride out of Luke AFB Arizona on my birthday a few years ago, now that's the way to spend a birthday! 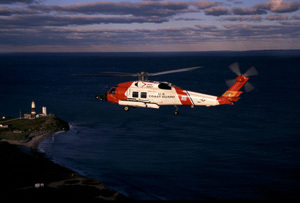 Three superb pilots, the best scenery in America and no airsickness, it does not get any better than that. This image is proof that perseverance and determination can accomplish anything. I love the Monument Valley Navajo Tribal Park. We did several passes over the park to get the right sunlight and the two Mittens in the background. If there is one spot on earth that supports the argument for intelligent design, this is it. Well, flare shots are too cool and this is my best one. Again, hanging out the back of a trusty KC-130 off the coast of San Diego I shot this Hornet popping flares. For this to work, I ask for a 3 count over the radio so I am ready since the flares come out quick. Just hit the shudder button and hope for the best. Once again, shooting out the back of a Herk. 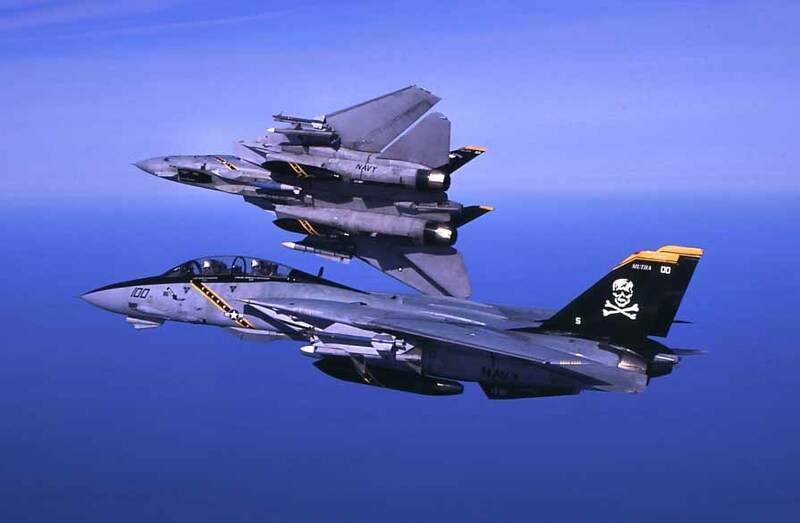 No jet ever looked better than the F-14 in Jolly Roger colors, the toughest fighter jet ever made. 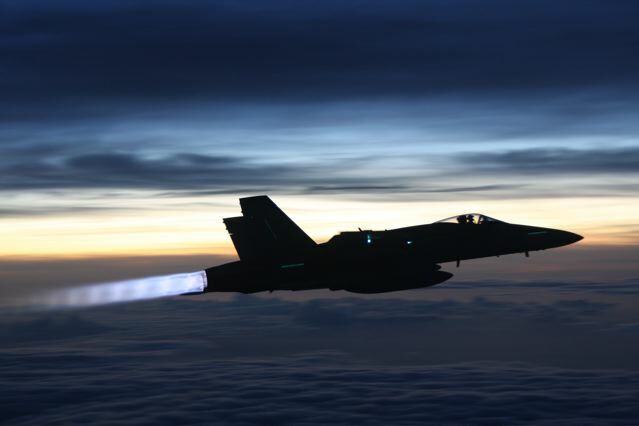 Tom Cruise owes a lot to the F-14, no jet had the look and cool of the big cat. Cropping Tomcats for head on shots at slow speeds is the only way to make them look good, otherwise you get a wide angle image since their wings are spread fully open at 180 knots. I shot this with one of my trusty old Canon 630's and a 80-200 L lens. I love, repeat, love the F-5 Tiger II. It's one of my favorite jets. 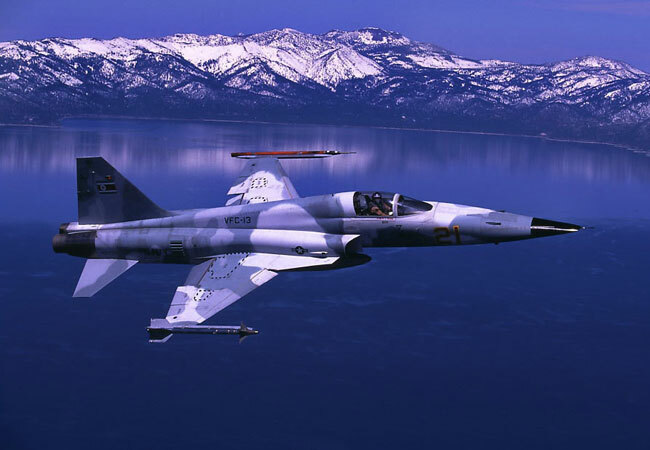 Small, sleek, put an F-5 in adversary colors, throw in Lake Tahoe and you have a winner. This bird is wearing colors to simulate the North Korean Air Force. It is assigned to VFC-13 and is stationed at NAS Fallon, 50 miles outside of Reno, Nevada. 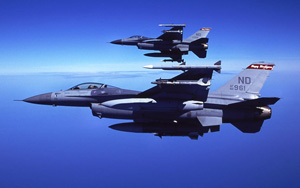 The real TOPGUNS fly these birds to train Navy Hornet jocks how to dogfight. 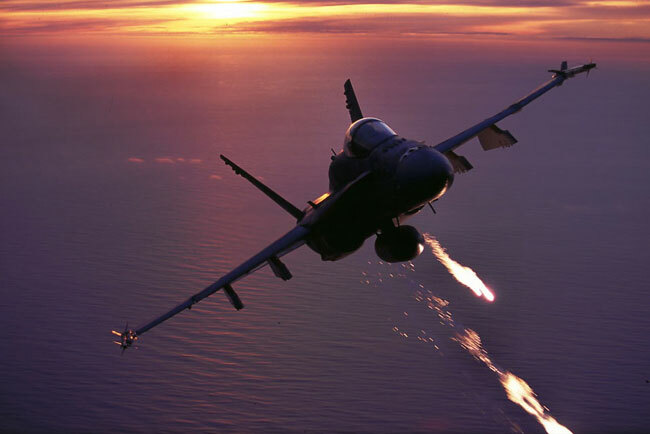 This shot depicts the grace and power of the Navy's F/A-18C Hornet as it lights the afterburners. 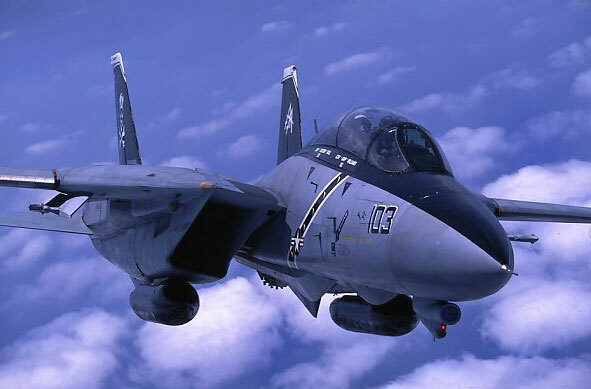 One of my favorite aircraft is the F-14 Tomcat, my favorite unit is the Navy's Fighter Squadron One Hundred and Three, the world famous "Jolly Rogers". Before turning in the F-14's for the new Super Hornet, the squadron painted two of their jets in the high visibility scheme of the 1970's. No combat bird looks better than VF-103's Tomcats with the skull and crossbones! This image was shot from a Lear jet one winter morning over the Atlantic Ocean. Boyhood dream realized!!! 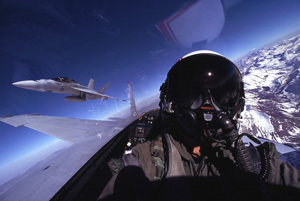 How can I not include a shot taken from the cockpit of an F-14? While we sleep soundly these are some of the Air National Guard guys watching over American cities. 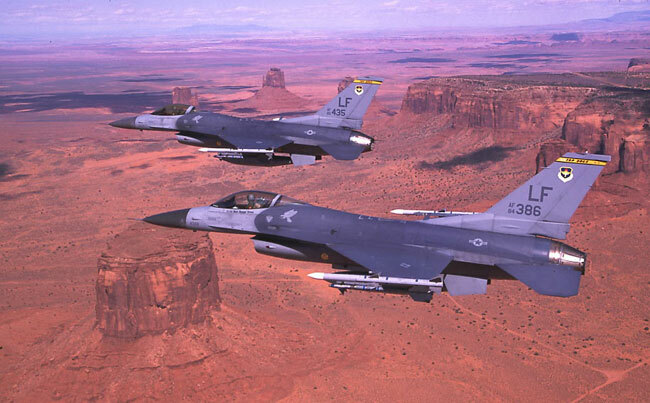 F-16's armed to the teeth, Osama's worst nightmare. Me with a Super Hornet wingman, now that's pretty neat. 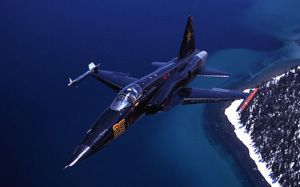 A black F-5 over Lake Tahoe, c'mon, how can this not be a TOP 10? 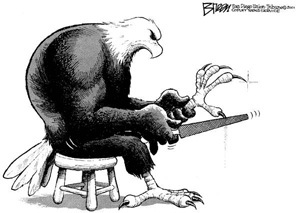 Artist extraordinaire Mike Breen penned this cartoon right after 9/11 in the San Diego Union Tribune. He was kind enough to autograph a copy for me for my office. One drawing, no words, speaks volumes though. God bless America.